Knowing where to begin giving Jonathan Demme’s 1991 psychological thriller The Silence of the Lambs the credit it is due is a challenge. When reviewing Steve McQueen’s period masterpiece 12 Years a Slave I focused on the importance of the opening sequence for devices, themes and plot clues that would inform our understanding of the remainder of the film. On this occasion the segue I have chosen is the introduction of its principal characters. First impressions have the same lasting effect on the big screen as they do in real life. Demme starts with the good guys, or girl in fact. 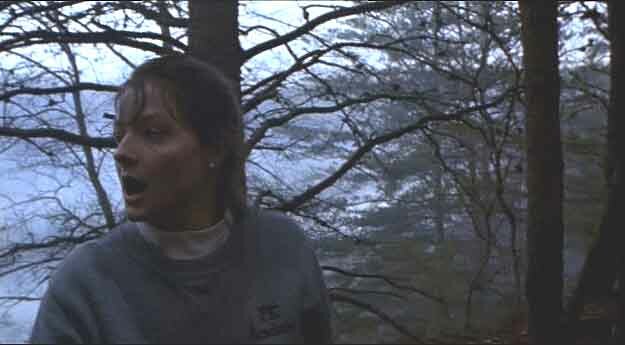 Black trees are silhouetted against the mist and murk of woods ‘near Quantico, VA’; the black lettering, edged in white, of the title and cast, are equally as bleak; and as the camera pans to the left, and down, we see the diminutive form of rookie FBI agent-in-training Clarice Starling (Jodie Foster) rope-pull her way up a steep incline. As she reaches the top of her climb, she inexplicably looks to her right before jogging off in the other direction. 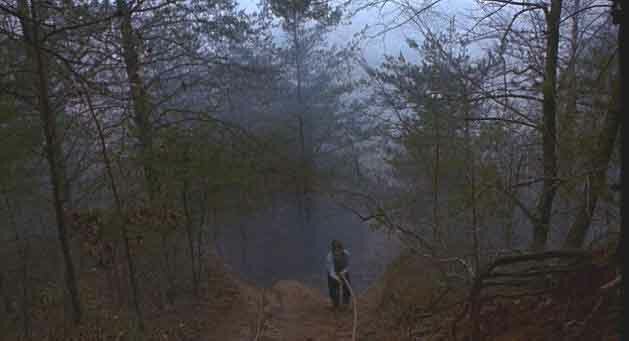 Continuing through the ever-deepening fog, she comes to a wide rope ladder that she has to scramble over – a challenge for someone of her physique – and as she runs away from the camera, hurdling logs, she is called back by an off-screen voice, whose owner then appears, bidding her to go in and see ‘Crawford’. Howard Shores’ haunting score accompanies this opening sequence, deepening the intrigue and sense of foreboding. It will continue to do so throughout without ever being too intrusive, adding an extra layer of menace to all that we see. So, what does this tell us about Clarice, and about the film? The notion of looking down, going down, of above and below ground, is established here by the camera’s movement and will return as we descend deeper and deeper into the mental institution in which Lecter is held, and later as we delve into the basement lair of Jame Gumb. Given the psychological element of the film our descent reflects the exploration of the deranged depths of each man’s mind – only one of which will allow itself to be uncovered. Secondly, there is the issue of Clarice/Foster’s size and lack of physicality. Surely she can’t be an FBI agent? How will she be able to disarm and apprehend vicious criminals? The fact isn’t that she struggles over the obstacles, but that she perseveres and succeeds. There is seemingly no-one around to check whether she completes the course but the audience knows that she does. A mousy, short, skinny girl completing the course alone without cutting corners is obviously determined, resilient and has a point to prove. Note also that this film is attributed to ‘Strong Heart Productions’ – a bit of a tongue-in-cheek joke by director Demme who added this to reflect a characteristic that Foster, who fought hard to be cast in the film, and Clarice have in common. Foster was tired of playing victims and Starling is determined to save one. We are not sure at this stage that Clarice will become our hero but would Harrison Ford, Richard Gere or Patrick Swayze not have been a better option? They’d sail over those obstacles. Part of the genius of Harris’ novel is in flipping convention on its head by placing a female in the traditional all-American male hero position. While in film it is not uncommon for a woman to be mistreated at the hands of a man, not often does another woman come to her rescue. Clarice, we will later discover in conversation with Lecter, is haunted by the screaming of lambs that she could not save from death as a child and this impotence in the face of innocent slaughter has become her raison d’etre. That the first character we identify with is a female trainee agent is significant. 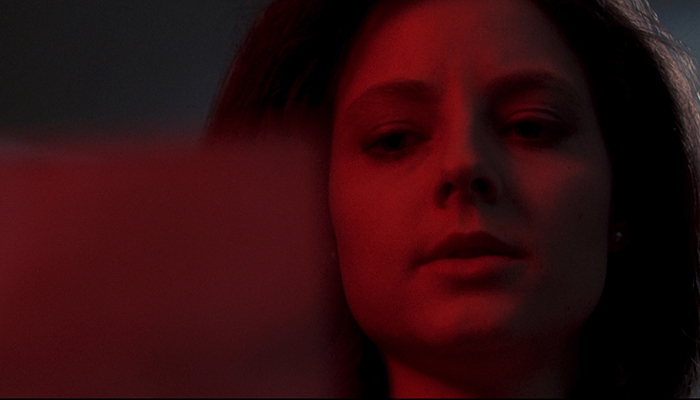 For the great majority of the film the audience’s point of view is aligned with Clarice’s and as such we take on her vulnerability and inexperience, as well as her grit and determination. Alone in the darkness it certainly isn’t going to be a walk in the park, but we’ll get through it together. The last comment to make here is on the almost unconscious look that Clarice gives offscreen at the top of the rope pull. Is she aware of her surroundings? Does she suspect that she is being watched? Or is it just the fluttering of a number of birds taking off that catches her attention? Clarice will become the focus of much male gazing as the film progresses because she stands out like a sore thumb in a world dominated by men, on both sides of the law, but the suggestion here that someone might be out there just plants a seed in the back of our minds. A man’s world. 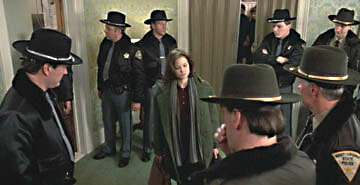 This screenshot, of a scene later in the film which takes places in the funeral home, is one of many examples of Clarice’s objectification by male characters. Jonathan Demme’s direction of Silence of the Lambs generates a sense of menace and unease that pervades every scene, preventing a viewer from ever feeling comfortable in their seat; a discomfort achieved even after these opening seconds. I envy those who may come to this film for the first time but warn you that the grip of its tension will not let go until you hit the final credits, and even then maybe not. As we sit in the darkness of the cinema, the world outside of what we see on screen from one moment to the next is a very real threat at all times; the fear of what we cannot see being one of the most basic and primal for it is created in our imagination – thanks here to subtle suggestion by the director and his actors. Anthony Hopkins’ performance as Hannibal Lecter is vital to this. Hopkins also sought to subvert conventional methods with his performance as Lecter: “Always play the opposite of what the audience expects, it scares them more,” said the now Sir Anthony who, if you can believe it, was almost completely unknown in Hollywood in 1990. Gene Hackman, who was first to buy the film rights to the novel, found the script too violent and withdrew his name from the casting hat; as did the more commercially viable Sean Connery. Third time was most definitely the charm as Hopkins is despicably excellent. Forewarned by her FBI boss Jack Crawford (an impressively ambiguous Scott Glenn) and then told that Lecter is “a monster, a pure psychopath” upon her arrival at a Baltimore high security mental institution by Dr. Chilton (played with lascivious relish by Anthony Heald), Clarice descends two flights of stairs, down a long ramp in what appears to be a basement, down further still and through a blood red barreled door where Chilton, who accompanies her, tells of Lecter’s terrifying visit to the dispensary, bathed under a Scorsese-esque red light. All that we have seen and heard sets the scene for the big reveal of what we assume will be the devil in human form. What do we find behind the plexi-glass of the very last cell? An ordinary-looking man in his fifties, grey hair swept back neatly, wearing prison overalls that could have been tailored for him and who politely, quietly greets Clarice with a “good morning” as if passing in the street or meeting for coffee. A far cry from the raving, animalistic lunatic that we were expecting and, as Hopkins said, all the more terrifying for it. We know what he has done and yet couldn’t consider this docile, softly spoken individual capable of such horror. Oh, how we will be proved wrong. Progressive close-ups bring us ever more dangerously near Lecter as the chase gathers momentum. Lecter proves that although he is incarcerated, freedom is more a state of mind, or his case supreme intellect. We know that he cannot escape (or can he?) and yet he exercises an influence on all that follows outside the four walls of his cell; a testament to Hopkins’ terrifying use of limited screen time. How, from inside his own cell, is he able to prompt Miggs’ death? How, later in the film, does he procure the golden pen whilst strapped into his vertical restraint? His unexplained, almost supernatural power adds to the mystical terror that surrounds him and engulfs us. Yet we cannot help but admire his charisma and acknowledge the fact that he shows Clarice more respect than the majority of the film’s male cast. The three screen shots above show Lecter, Chilton and Crawford all looking directly at Clarice and, by extension, us. A technique that breaks the ‘fourth wall’ between character and audience, our reaction to it is one of discomfort, which is precisely its objective, and it reinforces our association with Clarice’s point of view. A bold move and one of the film’s many stylistic successes. Last but not least in terms of principal players is the villain on the loose, Jame Gumb. Based to some extent on the real life serial killer Ed Gein, “Buffalo Bill” – as he is nicknamed – skins his female victims in order to complete a ‘suit’, for want of a better word, which he can wear to transform himself into a woman. An entire essay could be written on the themes of transformation and change in Lambs – the life cycle of the ‘death head moth’ a clear motif – as well as the issue of gender and sexual orientation. Actor Ted Levine, who struggled personally with playing such a despicable character, delivers a haunting performance with real force. Gumb’s character, his background and motivations are not developed to the same extent in Demme’s film as in the source novel and as a result it is difficult to define his sexual orientation or gender role. Some negative backlash against the film came from the gay community who were revolted by the representation of Gumb, who they considered to be homosexual. His character is too complicated and enigmatic to make such a suggestion with any certainty. Gumb is evidently deranged, confused and dangerous as a result of a traumatic and abusive past; it is too simplistic to pigeon hole him as a gay character, though. Screenwriter Ted Tally considered The Silence of the Lambs to be more of a detective thriller than a horror film. I have never been a fan of the horror genre and agree with Tally here; perhaps that is why I admire Demme’s film so highly. 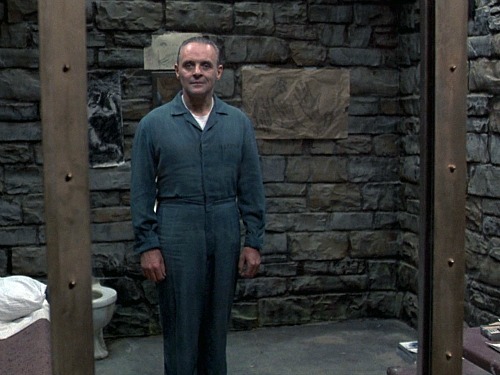 Just as Hopkins suggested for his portrayal of the arch villain “Hannibal the Cannibal,” doing the opposite of what an audience expects will scare them more. Lecter prays on people by getting inside their head (before eating them), and the psychological element of this film will stay with you far longer than any film with chainsaws, hockey masks or ghouls with a kitchen knife. The Silence of the Lambs is a timeless classic featuring career-defining performances and is a sophisticated alternative to the Halloween series at this spooky time of year. Posted in Classics, Oscars and tagged Anthony Heald, Anthony Hopkins, Horror, Jodie Foster, Jonathan Demme, Psychological, Richard Harris, Scott Glenn, Ted Levine, The Silence of the Lambs, Thriller. Bookmark the permalink.